Towards the middle of November 2017, I was approached by a group of 4 guides : Rex, Elias, Eva and Shannon. All of these do their guiding ONLY in the Balule Reserve and informed me rather sadly that there were no buffalo left – as a result of the drought the buffalo had trekked east to Kruger, where rain had fallen. Last year there had been no rain anywhere so the buffalo, terribly nutrient-deficient, had remained. But now in 2017 the problem was that these 4 guides were unable to show their guests all of the Big Five as there simply were no buffalo. 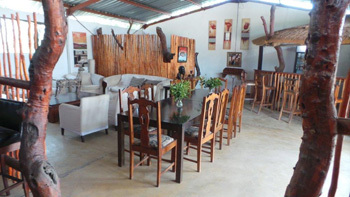 I explained that our Viva guests were very fortunate as, unlike some of the fancy lodges in Balule that operate ONLY in Balule, Viva Safaris guests would see buffalo in one of Kruger Park or Tshukudu or Motlala – so I wasn’t too concerned. But the Frantic Four were still not appeased – what about them personally – no buffalo sightings for over 6 weeks – and they demanded to know what, exactly, was I, the General Manager, going to do about the lack of rain. You will recall that, as far back as the time of Nyarai, I had attempted to attract the rain by the famous Tremisana Rain Dance sessions. Dressed in only teeny-weeny, itsy-bitsy, polka dot bikinis, our admin staff had successfully performed the Rain Dances and we had broken the droughts. So off I went and procured such teeny-weeny, itsy-bitsy, polka dot bikinis for Thandy and Eva and a teeny-weeny, itsy-bitsy, polka dot speedo for Armand. Try as they did, with great energy I must admit, their Rain Dance unfortunately did not work. So I then procured teeny-weeny, itsy-bitsy, polka dot bikinis for Paulina, Delina and the vivacious Pretty who also energetically joined Armand, Eva and Thandy for Rain Dances. The Rain Gods remained unimpressed. The staff now insisted that I join them in the Rain Dance. Being a modest fellow, I had to solve the problem another way. And solve it I did : I arranged a record number of guests ( 8 – our absolute maximum ) on our Sleep Out Safari package to sleep out on our platform at Marula Boma on the night of 24 November. Things were looking bleak at 20h00 as the stars and sliver of moon were clearly visible. But Murphy applied his Law and by 01h00 on the morning of 25 November, the rains came down. Just how resourceful can one get ?? It’s been a busy and productive month at Tremisana and lots has happened since my last report. We had our first good rain and the bush is changing slowly and the animals are loving all the new grass coming out. Viva vehicle close up to breeding herd of elephants. On the 9th of November at Barnard by Mhenti Road we found a Big bull Elephant next to Shighamba Dam that came straight to the road and towards us about one metre from the vehicle passing towards Nkambako Dam – nearly touching the vehicle! On the 11th we had a good day in Kruger : on the H7 we found Leopard with an Impala kill on a Marula Tree about 50 metres from the road and a pride of lion 1 km from Bobejankrans. Another Pride 1 km before Nsemane Dam. At Nsemane Dam we found a big herd of Buffalo and Elephant swimming in the dam. On our way out we found a White Rhino crossing the road – that made all of us extremely happy. Elephants swimming in Nsemani Dam. 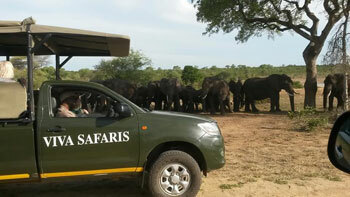 On the 19th on Sunset Drive right at Tremisana Lodge we had 3 elephant Bulls as our first animal sighting on drive. On the 25th in Kruger : On H7 about 500 metres from Reception we found Wild Dogs crossing towards Manyeleti. 6 km from the Gate we found a mating pair of lions. On the S127 we found 2 male lions and one female. On the way out we found one female cheetah with 4 cubs. The cubs were playing – chasing each other all round the mother – absolutely brilliant!!! This month has been very quiet as far as sightings go – but yet filled with unexpected surprises. It has given me the chance to focus more on the smaller things in the Bush. We have had amazing experiences on the Bushwalks and multiple encounters with the river residents, the Hippo and Crocodile. We have also spotted some of the plains game such as Waterbuck, Bushbuck and Impala. On the Bushwalk we allow our guests to become part of nature giving them the opportunity to walk through an unspoiled natural Big Five area. We focus on the small things and encourage our guests to take part in the activities we do such as track identification and medicinal uses of the trees and plants as well as a few African games (Everybody loves Bush Chocolate). I have been on a few morning drives and managed to spot multiple plains game – it is a great way to wake up and our guests’ last drive before we have to say goodbye. We have had a hard time as it’s been extremely quiet but a few pleasant surprises such as a Bull elephant making its way towards the river and lovely plains game sightings when the weather is not too hot. We have had multiple zebra and giraffe sightings as well as some new bird species around the river – I was privileged enough to spot a violet backed starling a few days ago. 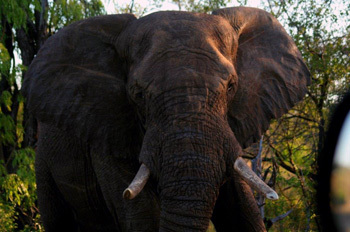 We have had a few sightings of the Big Five such as a pride of 10 lions and a Bull Elephant in musth – both on Barnards. We have had surprise visitors at the Boma dinner such as porcupine, honey badger, small spotted genet, hyena and civet. Overall it’s been a good month even with the quiet sightings and eventually when we receive good rain we will spot more animals. Hello – Halala – again it’s happening down at Tremisana on our quiet month. We have been hustling for the animals as usual. On a Sunset Drive along Olifants road we saw impalas, duiker and on Campfire there were a lot of kudu. 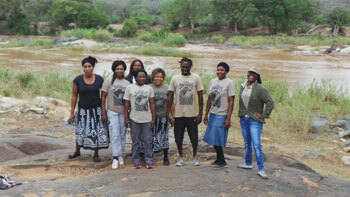 At Marula Boma we saw honey badger and porcupine – great happiness for my guests. It was amazing for them to see a crazy honey badger because they had heard about it so they were very happy to see that. I did a sleep out with guests at Marula Boma and we heard lions roaring and hyena calling. It was amazing. On the bushwalk we saw hippos, crocodile and nyala. Later on the afternoon walk we saw a leopard – my guests were very happy. On Sable road we saw jackals and zebra. I did my afternoon drive and we went to Barnard and it was amazing to see a herd of elephants. With the lack of grass, we are regularly seeing only browsers such as impala, kudu, giraffe and Black Rhino. Viva is lucky that all our guests get to go to Kruger Park – they come back with huge smiles on their faces. Nature will always surprise you anytime. On the 4th November it was hot about 38C, yet sightings were good, Got all Big Five : lions on S100, buffaloes S100, white rhinos H6 ,Elephants all over and leopard Sweni road. Great shot of White Rhinos. 12th : Kruger again, rhinos near Orpen, elephants all over, lions S100, buffaloes Muzandzeni S36 and leopard on H7 before S12 Girivana road. 17th : Kruger again; hot day ,white rhino near reception, lions Rabelais road S106, elephants all over, buffalos Ximangwanini dam. 24th : Kruger, lions before Kingfisher turn off, buffaloes on S106 road, elephants all over, leopard near Kumane dam and general game on Sweni and Orpen roads. 26th : Kruger, lions S100, buffaloes Sweni windmill, elephants Sweni road, rhinos H7 before Nsemani dam and leopard S39 and general game on Orpen and Timbavati riverbed. 27th : Kruger again, it was raining and cold – difficult sightings on the day, lions on H6, elephants all over, rhino near Orpen and general game on Orpen road. First of all, I want all to know that a safari isn’t like a Zoo visit – sometimes we are lucky and sometimes we are not. This month has been quieter than usual and there is a proper natural explanation. We haven’t received enough rain in a very long time – the bush is therefore dry and so some grazers have fled Balule for the greener grass of Kruger where there has been rain. If the herbivores are moving so do the predators. This month has been an eye opener once again onto our beautiful land. We had some proper time to get to give a closer look into the bush. We had visited the hippos every day and they have entertained us. About 10 days ago we had some rain, some of the flowers / leaves have started coming out, and so we are now full on some botany, also some of the migratory bird have come back to us and what a pleasure to be able to listen to our woodland kingfisher over and over. Despite that this month was quiet, I happened to be very lucky one morning. On Campfire property we saw a lot of impalas then I spotted some very fresh tracks of lions. We changed our route and went on to Barnard. After some tracking – losing – finding again – the tracks we ended up with a super sighting of 3 big males and a couple of females. Watching them drink that morning and having them walk past the Cruiser was brilliant ! For the Summer season (November to February) we have decided to postpone our afternoon drive by 30 minutes. This month the suicide birds, Red Crested Khorhaan, have been calling more than ever and display their “suicidal trick” over and over for us. 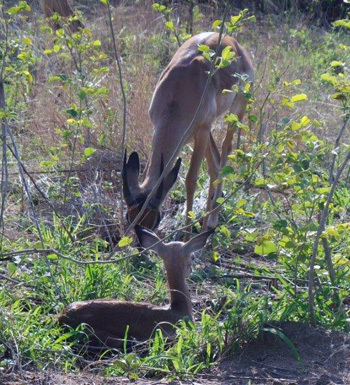 With our late rain, we finally have started seeing some baby impalas coming out. After driving for some hours in the sun, I decided to go and see the almost dried out dams on Barnards. We found 3 male elephants busy feeding and being very relaxed. 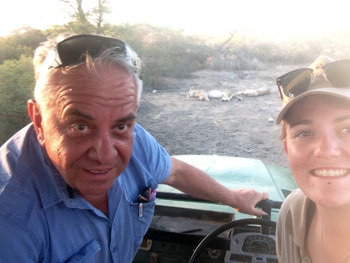 Another drive, another story, after spending another week without seeing the lions we got lucky – a guide from Ezulwini told us where they were. They were like proper flat cats – horizontal. I had the GM with me – he brought me luck ! Eva, Piero and flat cats. This month has been full of hyenas. It is interesting to see that whenever the sightings of lions become rarer and rarer, the hyena sightings happen more often. We generally have been reasonably lucky, despite the lack of grass. 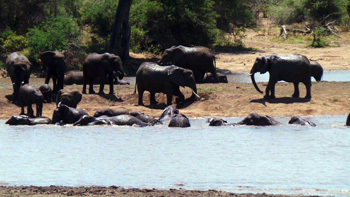 We have seen elephants and giraffes along the Olifants River and a pod of hippo in the river. There is a new born calf with them. Two large Crocodiles are seen regularly on the river bank. A herd of 10 Waterbuck frequent the area. Kudu are seen often and a new arrival is a Nyala bull – not sure where he originated from. We also see Bushbuck along the river. On the way, we sometimes see a pair of jackals with pups. We regularly see Impala, Kudu and Giraffe and now and again a small herd of Zebra. There is a big herd of Waterbuck at the Spruit on Rome 1. We have seen the Takazile lion pride – consisting of 10 irregularly. 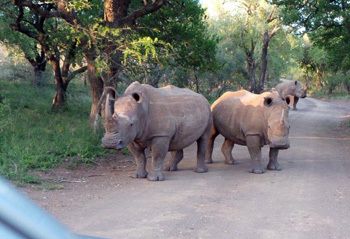 Also a herd of 3 White Rhino are seen on and off and there is a Black Rhino with a calf. The impala have started to drop their lambs. I have not done many but recall one successful Sundowner Drive on which we saw 2 Bull Elephants along the Olifants River; 2 Black Rhino on Rome 1 and on the way back 3 Bull Elephants at the Tremisana car park. The day started off with amazing breakfast. We got loads of general game including giraffe, zebra, baboons, blue wildebeest and a white lion with a cub to top it off!!! Wow!! We sighted Buffalo close to Orpen gate. On the H7 we viewed general game including Ostrich. 6km further on there was a male lion which had killed a blue wildebeest and dragged it off into the bush. Later we viewed elephants in the river bed drinking and splashing water – what a sight to see these magnificent mammals playing around. At Nsemani Dam, herds of Elephants, Hippos and a big Crocodile. At the same time we viewed giraffes in the distance and zebra coming down to drink water what a privilege to see Africa alive in front of your eyes and everybody reading this can say the same 🙂 We went on to the S100 where we viewed huge herd of Buffalo and a lioness with a cub. After some time she got up and started stalking some Impala. On the way back, we saw multiple bird species including Martial Eagle. On the S106 there was a pack of Wild Dogs that had just finished eating a scrub hare. Just before the last boom gate we found White Rhino and a big male Lion. Africa once again proved itself to be so beautiful !!! Close up of Elephant Bull. I am from America, studied wildlife courses for my FGASA qualification at Campfire Academy and am a new guide at Viva. Another good opportunity to work on skills more suited to walking in the bush; my tracking has improved dramatically from on foot experience in the loose soil. Prolific bird activity near the river means more chances to introduce birds to guests (saw a giant kingfisher for the first time myself). Hippos and crocodile frequent the banks and shallow waters and I feel more comfortable in reading their behavior. On my last two drives back to camp I have been lucky enough to show my guests black rhino on the rocky slopes. Again generally quiet on these drives in the heat of the day. I like to check by water sources which has paid off : I found lions twice at Ngwenya dam on Barnards on two separate occasions, one of which was on one of my first afternoon drives with a particularly raucous family of excitable Australians. Their pleasure at every sighting and stop on the drive was refreshing. 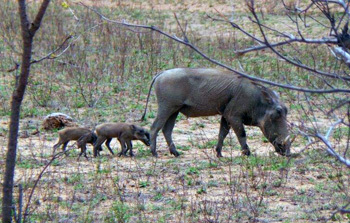 Saw lovely warthog new borns. I only participated in one sundowner drive this month, with a gentleman named Alex who was travelling by himself from Hong Kong. He was generally quiet and listened politely to everything I had to say. He had an impressive camera as well, carefully photographing every kudu, giraffe, and impala. A stop by the dam on Barnard’s was rewarded with a view of nine lions sprawling lazily in a spruit in the late afternoon sun, much to Alex’s excitement. Spotted lionesses moving down Olifants road right outside the entrance to Marula Boma on my first night drive with Viva – quite an exciting experience for myself and my guests. It’s also nice to show guests an array of generally hard to find nocturnal animals that frequent the boma : honey badger are regulars every time I have gone, but I’ve also been lucky enough to see porcupine, genet, and hyena as well, with the addition of lions roaring from very nearby. I find my spotting is very good at night and improving. Predominant activity of the month and extremely rewarding experiences. Massive herds of grazers and endless things to talk about. Excellent encounters with elephants, including breeding herds passing around our vehicle on all sides, bulls sparring on many occasions, and incredible collections of various groups at Nsemani dam. My first week in Kruger ended in two sightings of Wild Dog packs, leopards feeding on three different impala kills in trees over the course of several days, many lion sightings in various group sizes and often mating, as well as white rhino. Very rarely a dull moment despite the heat. 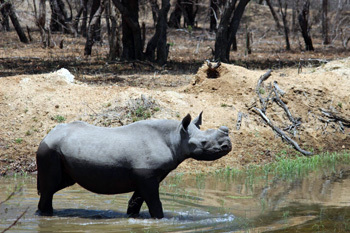 Learned much about navigating Kruger – I had only been there twice before but now I am very confident in driving around. What an immense privilege it has been !!!! We have completed the reroofing of staff carports. We have upgraded the staff accommodation. A third thatch umbrella has been erected near the swimming pool. The old cell tower has been removed – no doubt we shall use the remaining Vodacom footprint. Our thatchers have been hard at work combing all roofs before the rainy season. Our resident Black Rhino is seen daily as he uses Marc’s Camp to hide from the dominant Motlala bull that tends to keep away from human habitation. We have erected a double carport for the 2 new game viewers we have bought. We have built a new thatch-roofed Boma at the dam which we have filled using the borehole water. Coffee the Black Rhino loves to lie there when it is hot. We have added thatch ceilings inside all the 8 rooms. I had my first Cappuccino from the fancy Italian coffee machine that is finally connected to the equally fancy water supply system – not too bad. We have erected an additional double carport for staff cars. We will be changing the 5 star luxury lodge packages as they will involve return flights to Hoedspruit from Johannesburg and Cape Town. We shall be sending you the new tariffs within a week. As I enter the twilight of my life, I have decided to put some time and energy into additional community outreach work. You may recall that Viva Safaris has always supported the local Catholic mission run by the Comboni Missionaries. We have also assisted other projects in Acornhoek and have contributed to Soup Kitchens and Clinics in the area. As of 1 March 2018, Viva Safaris will be hiring Masango Camp to Catholic Volunteers Africa – a group that will make a meaningful contribution to the lives of the community. I have roped in some family members to give of their time in this outreach exercise. We plan to involve Volunteers in uplifting the community by building a creche and a clinic, establishing fish farming and 1 day old chick rearing facilities, vegetable gardens and assisting with the existing weaving project. We shall help with academic support as well as development of sports skills. A multi-purpose sports facility will be built. The packages will be of 14 days duration : 8 days of work in the community and the rest of the time doing various safari activities. 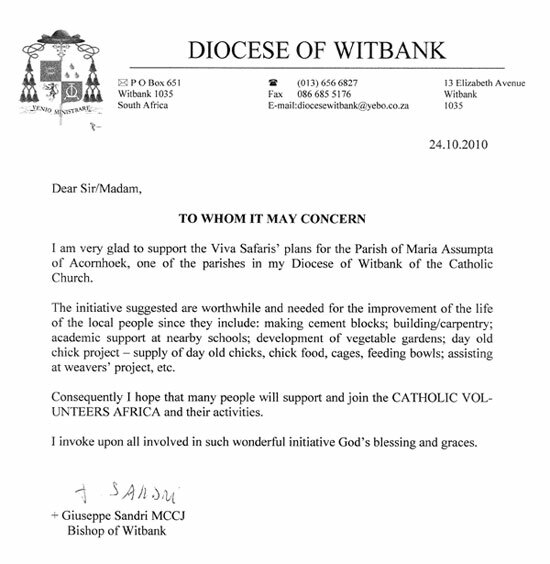 The Bishop of Witbank, Joe Sandri, also a Comboni Missionary, has given this new project his whole-hearted support and I am confident that a whole lot of good Volunteers are going to significantly improve the lives of a whole lot of deserving people. I thank you, our loyal travel agents, for your support this year – it has been nothing short of awesome. I assure you that ALL of us at Viva will continue to strive to give you our very best service. I treated our staff to a game drive along the Olifants River on 30 Nov 2018. They all had a great time and insist that I return to guiding – proverbial brown-nosing at its worst ! So all I can say is WOW!!!! This Lodge was by far my favourite and I thoroughly enjoyed everything about this place. The staff were so friendly, and the food was delicious!! We got served 3 course meals for dinner and the food was of high standard. The rooms are stunning and elegant. There is also a private plunge pool at the room which really helps with the heat and there are tanning beds to lie on and catch a nice tan. This is by far one of the best places that I have stayed at. Perfect for an escape to the bush. My husband and I just got back from a 5 day safari with Viva Safaris, staying at Tremisana Game Lodge. We had an excellent experience right from the moment we arrived. The staff at the lodge greeted us warmly and made us feel very welcome throughout our stay, providing professional, excellent service. Our rooms were perfect for what we were looking for and were always clean. We were well fed and our evening meals were especially delicious. Hats off to the staff for making our little home away from home such a delight! Abbiamo partecipato ad un safari di 4 giorni partendo da Johannesburg. Il Kruger non è proprio vicinissimo, ma dalla mattina del primo giorno fino alla sera del quarto siamo stati trasportati dai pullmini della Viva, che si è occupata di tutta l’organizzazione. I game drive erano ben organizzati e con i fuoristrada abbiamo potuto trovarci a due passi da leone, giraffe, zebre, bufali, rinoceronti, impala, kudu e tanti altri animali. Solo il leopardo non si è fatto vedere, ma sapevamo che era difficile. Quello che mi ha colpito molto è la grande competenza, serietà ed il profondo rispetto della natura che avevano tutte le nostre guide: chapeau. Gli alloggi al tremisana erano più che confortevoli, al Marc’s eravamo in tenda, una bella tenda con il basamento di cemento, quindi ok. Il cibo era sempre di ottima qualità e lo staff molto cortese. Il tutto per un prezzo più abbordabile di altri: soldi ben spesi. Marc’s Treehouse Camp was fabulous! We stayed in treehouse #2 and couldn’t have had a better experience! We had a herd of buffalo pass under our balcony, and saw the resident rhino, “Coffee”, on multiple occasions. Every staff member became great friends and we were so thrilled with everyone and everything. Breakfast and dinner were home cooked meals and just what was needed for our hungry stomachs. We cannot wait to go back! On behalf of our staff, I wish you and yours a Blessed Christmas and a fulfilling 2018.